Elegant aluminium case for business cards with a mat silver exterior. Stores and protects business cards. Holds 20 business cards. Elegant business card storage box. For 20 cards measuring 95x58mm. 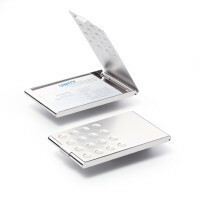 The practical VISIFIX® Plus binder ensures important data is at hand. 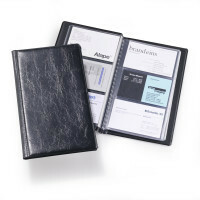 Telephone, addresses and fax numbers can all be filed in one ring binder along with business cards. 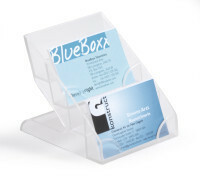 A simple yet stylish desktop dispenser for business cards. 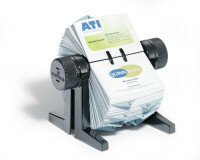 The business card dispenser holds up to 50 business cards of up to 100 mm in width. Adhesive pads are enclosed. 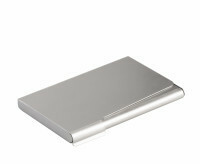 Elegant aluminium business card case with 2 separate compartments, ideal for separating customer and business cards. 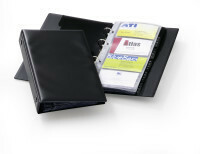 The practical business card album with 20 transparent polypropylene pockets for 400 business cards and 4 ring filing mechanism and 12 piece index. The practical business card album. 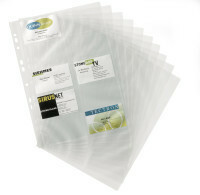 With 20 transparent polypropylene pockets for 400 business cards, with 4 ring filing mechanism and 12 part A-Z index. 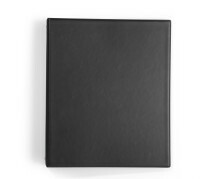 Business card album in A4 with grained surface and welded pockets for 400 business cards size 90 x 57 mm. The exclusive business card album. Size: 255 mm high x 145 mm wide. Brown cover with gold-coloured decorative corners and mechanism with a beige index. Business card ring binder with 20 pockets for 400 business cards size 90 x 57 mm. 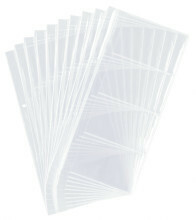 Stylishly designed business card ring binder with 25 transparent polypropylene pockets for 200 business cards 57x90mm. 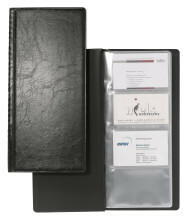 Business card file with 100 pockets (104 x 72 mm) for 200 business cards. The pockets are designed to allow simple insertion and removal of the cards. Complete with 12 part A-Z index. 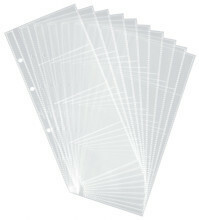 10 transparent polypropylene pockets for 200 business cards, multi-punched for all ring binders and files. Business card ring binder with 20 pockets for 400 business cards size 90 x 57 mm. Complete with 12 part A - Z index. 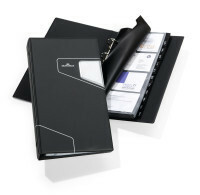 Business card album made of attractive grained PVC foil with welded pockets, for 96 business carrds 57x90mm. 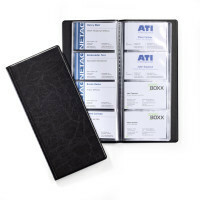 Business card album with transparent welded pockets for 128 business cards. 57 x 90 mm. Business card album with transparent welded pockets for 96 business cards. Business card binder with 12 removable pockets for 96 business cards 90x57mm. 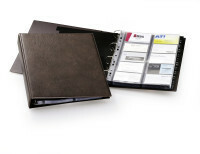 Business card album made of attractive grained PVC. With welded pockets for 72 business cards 57x90mm. 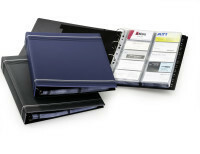 Business card album with 4-ring filing mechanism for storing up to 96 business cards (57x90mm). Transparent plastic business card display box with four compartments for the storage of up to 240 business cards. 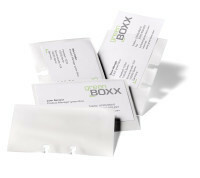 40 transparent business card pockets for VISIFIX flip product code 2417 and VISIFIX desk product code 2413. High quality, double rotary card index with 300 double-sided business card pockets (72 x 104 mm) for 600 business cards. Rotary index for the storage of business cards. With 200 double sided business card pockets, with capacity of 400 business cards.